All alumni of the USC School of Cinematic Arts Summer Program make short films. Some of these films go on to have successful screenings. Some of these films go on to do well at film festivals. Some of these films launch careers. Of all these films, one film, La Femme et le TGV (2016), has climbed the mountain to receive a nomination for the highest award available in the medium -- an Oscar nomination. 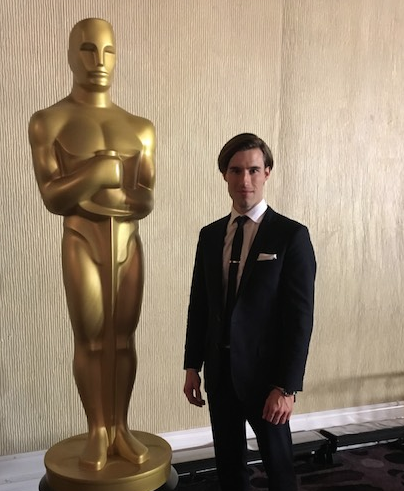 The film was executive produced by Summer Program alumnus Jean de Meuron ‘12. Le femme et le TGV tells the charming tale of an elderly woman, Elise Lafontaine (Jane Birkin), who has been waving at an express train that passes by her house every day for many years. One day, she finds a peculiar note in her garden and begins a heartfelt correspondence through poetic letters with the train conductor, until one day the train stops passing by her house. Her resulting journey breaks her out of her shell when she travels to find that lost connection and her close, but never before seen companion. The two struck up a remarkable collaboration: They made the film, found success, and de Meuron began a carefully thought out publicity, marketing and awards campaign for the Oscars, which he spearheaded. De Meuron credits his time in the Summer program with much of his success and, in particular, his courses with Sebastian Twardosz. After graduating the summer program, de Meuron worked as an intern at MTV Networks, Viacom International Media Networks, Paramount Pictures, The Weinstein Company, Universal Pictures and MGM. While interning at The Weinstein Company in the Marketing, Creative Advertising Department, and for Harvey Weinstein’s office, de Meuron simultaneously produced La femme et le TGV with his producing partners Giacun Caduff and Bela Böke. Further, de Meuron started his professional career at Scott Rudin Productions, working as Marketing Coordinator for prolific producer Scott Rudin.